Brother Adam's® Pure Botanical Honey has an exceptional taste which reflects the sunburst radiance of a summer's morning. It is the essence of a traditional honey! This outstanding honey has different levels of taste – starting frm sunburst to fruity to absolutely sublime - you'll have tasted nothing quite like this special honey! Just like Brother Adam – the Bee Master of Legend - our traditional methods of beecraft ensure this honey comes to you as pure as the bees intended – nothing added, nothing taken away! 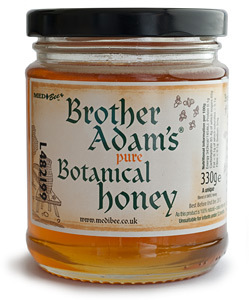 Brother Adam's® Botanical Honey echos the taste of floral bliss - its secret known only to the bees. You will gasp in acknowledgement - enjoy 2-3 teaspoons per day on toast, in yoghurt or just as it comes straight from the jar. Can you wait to taste?